Repairing a Silo – without letting her tip! 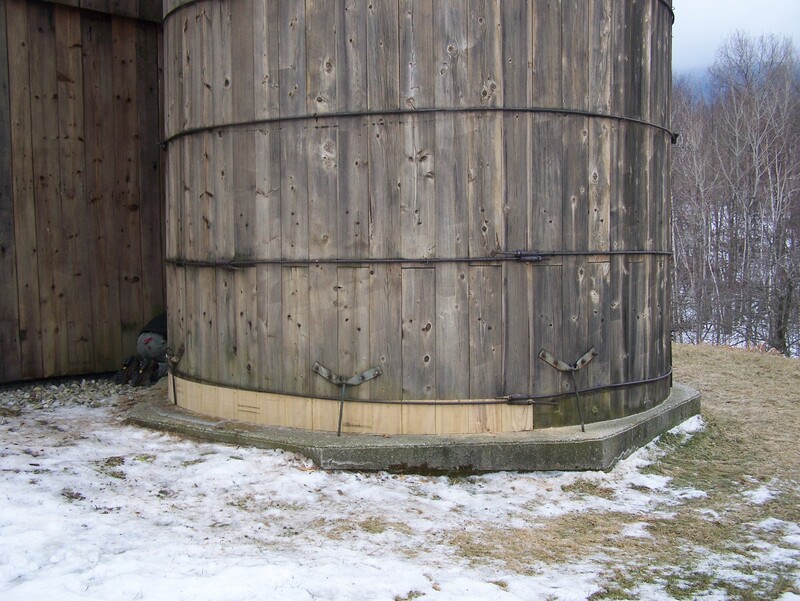 I recently repaired this wooden silo in Danby, Vermont. It was originally built in the 1850s. While the silo is not currently being used, the owner wanted to maintain the look and feel of his New England barn home and asked me to repair the vintage wooden structure. It had originally been used to store silage for cattle. The silo had a 38-foot circumference and most of the bottom boards around the base were rotten. I was hired to fix this tall task! Luckily, only four inches of the base wood was rotted. 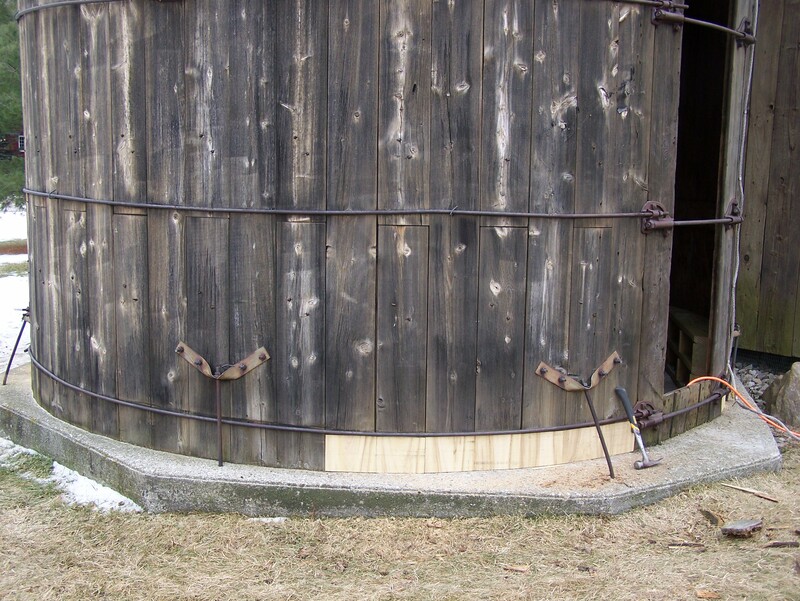 To restore the silo, we cut seven inches up to get back into solid wood. 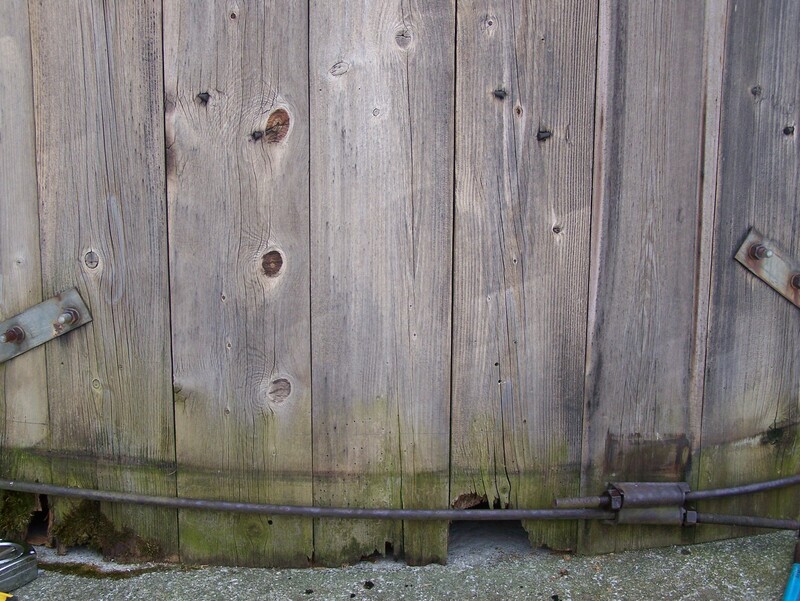 The original silo boards were either spruce or cypress, but I used locust wood for the repair. Locust is plentiful in our area and is our natural “pressure treated” wood species, meaning it is very resistant to moisture rotting the wood fibers. We had the new pieces of wood custom sawn to the exact dimensions we needed to ensure they would match the size of the original silo boards. 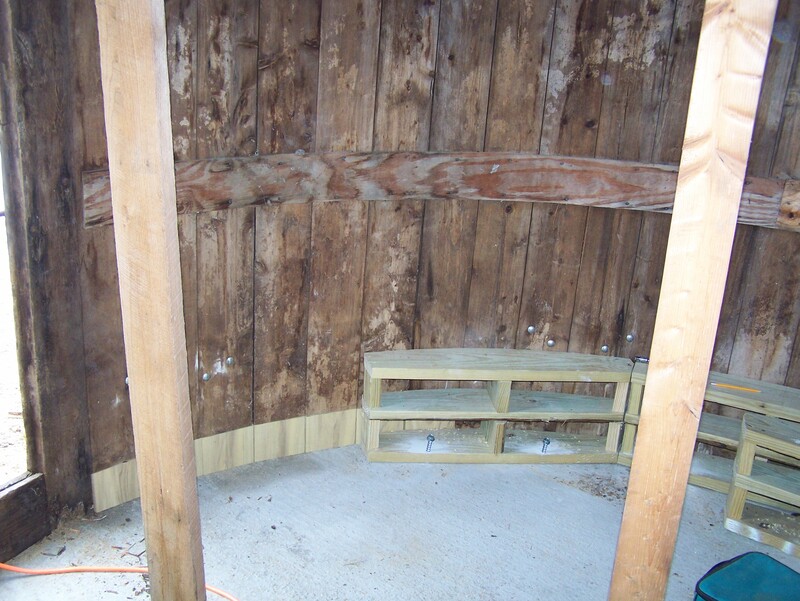 In order to repair the frame, we first built an internal frame on the inside of the silo. This frame enabled us to screw the short pieces of locust wood back into something solid. This system ensures the integrity of the repair and will help the silo stand tall for decades to come. I used a three-tier system, shown below. The first tier board was fastened to the concrete floor at the base of the silo. The second board was for fastening the new seven inch locust replacement silo pieces. In the third level, I attached the original section of the silo board. With these three levels in place, the silo boards are now secure and there is plenty of space for air to circulate inside the silo. This air circulation will help prevent rot in the future. The silo’s wooden walls are two inches thick, so I could not use my preferred routing method to duplicate the original tongue and groove boards. Instead, I used three table saws to carve the tongue and groove system for the replacement pieces. 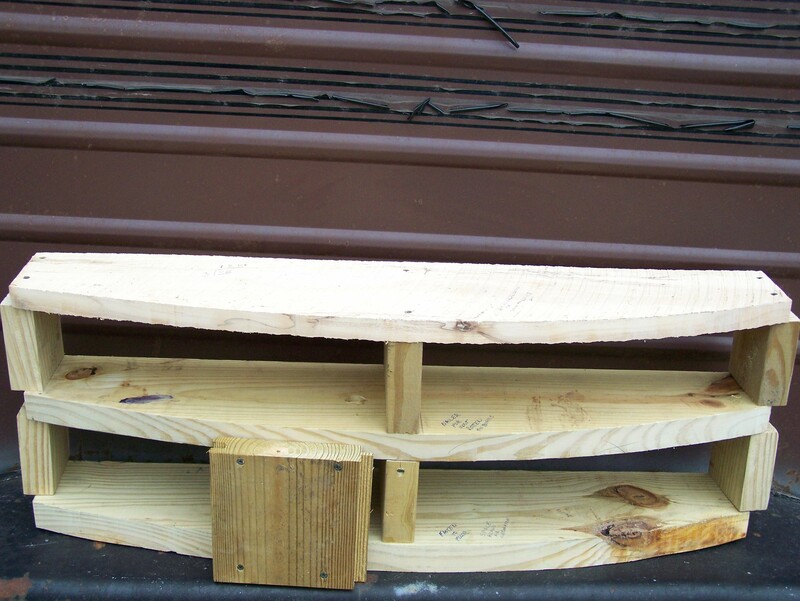 Tongue and groove joints allow two flat pieces of wood to be joined together to make a single flat surface. It’s a wonderful system that ties all the boards together. We cut one three-foot section at a time, secured them to the internal framing, and then moved on to the next three-foot section. There are twelve sections in all. Nine feet of the original boards were still solid and did not need restoration. I feel good about the repairs we did to this beautiful historic property, and I believe this system will hold up another 150 years. We left some locust boards in the silo, so if another repair is needed in the next 50 years or so – they are ready to go! That untouched original 9 feet of silo might need repair in 30 years! In working on this silo project, I was once again grateful to live in New England and to work together with people – like the owner of this silo – who value history and are willing to invest in ensuring that old barns and silos remain part of the landscape for generations to come. We all benefit from their passion to preserve our heritage. 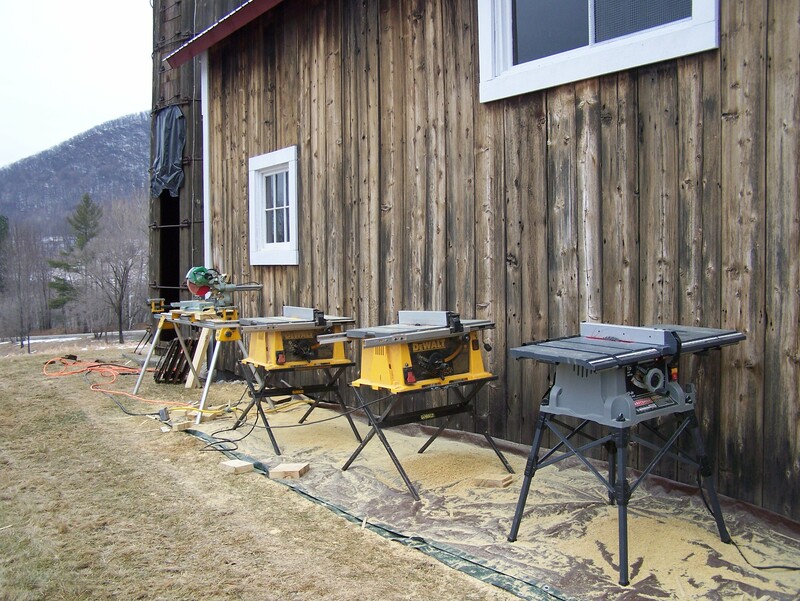 To see more examples of historic properties and old barns I have restored at Green Mountain Timber Frames, please see the completed projects on my website! This entry was posted in Green Mountain Timber Frames, Post and Beam, Timber Frame Projects and tagged barn repair, colonial america, historic New England, historic silo, Historical New England, reclaimed wood, Silo, timber frames Vermont, timber framing, vermont timber frames, vermont timberframes by Green Mountain Timber Frames. Bookmark the permalink. Wow – that is amazing. You must have quite the reputation to have been chosen to do this project. I’m sure it was a challenge and you came up with a wonderful solution! I did not know about the properties of locust wood…or that it was plentiful around these parts. Another great and interesting save!